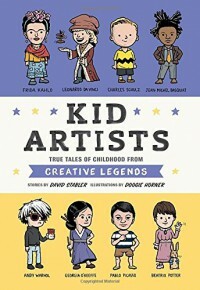 Kid Artists does a fantastic job of introducing a variety of artists to young readers. Divided into three sections, the artists included are from a variety of backgrounds and styles. I was particularly pleased with the inclusion of Canadian artist Emily Carr, whose home I toured on a visit to Victoria, B.C. Each artist's mini-biography starts in childhood and continues on to show the effects of their early circumstances and experiences on their adult lives and artistic careers. Written in a very accessible manner, the illustrations stand out as a compliment to the text and for the humor that they add. Recommended for intermediate to middle grade readers (or their parents & educators) who enjoy learning about other people’s lives, and especially for those who are aspiring artists.